Yes when you use Windows media player you get loads of pictures (JPGs). Even unticking the boxes in options dosn't work. Do you have to disconnect from the internet before using WMP? I am facing almost same problem. When I am going to open a file it shows a warning. You need to show more in System Spec's than just your O/S. I have 7/64 on my machines and no problem with opening WMP. Yes it shows a ******* of pictures, because those are all the images I have catalogued on my machine. What are you trying to do with WMP? Click "Pictures" and it shows the images you have installed and catalogued (hopefully) on your PC (whatever it is) Click "videos" and you get videos you have installed. Please also moderate your language. If you mean to say "a lot of" then say that. Anglo-saxon adjectives are best heard in the pub. Oh my my. I simply get rid of Microsoft software on my system. Download a nice media player like VLC or potplayer, etc. Although Windows Media Player is a popular choice for playing media in Windows, its features have been criticized in comparison to competitors’ media players. In particular, the player has been criticized for not working well with third party codecs. Whatever your reasons, there is no need to keep Windows Media Player installed on your PC if you never use it and don’t intend to use it. Keep in mind, however, that uninstalling the player from Windows affects all users of a PC; once you uninstall the player, no user of the PC will be able to use it. Before you make such a PC-wide change to your computer, check with its other users to see if they mind if Windows Media Player is no longer available on the PC. You just may save yourself a few headaches brought on by making a change the affects other users. Before you can uninstall Windows Media Player from Windows 7, you need to log in to your PC using an account that has administrative privileges. Once you log in, click on Start>Control Panel>Programs>Programs and Features. 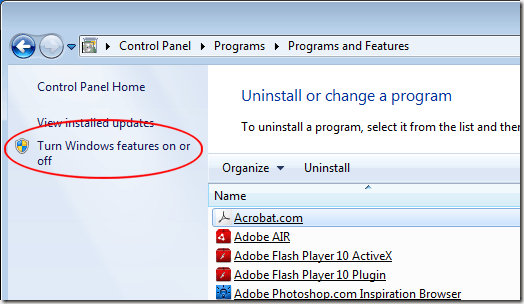 This will open the Uninstall or Change a Feature window. 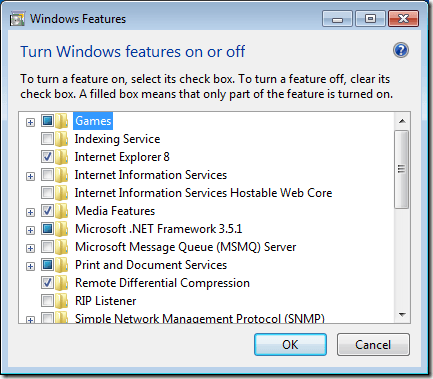 To the far left of the window, click on the link titled Turn Windows Features On or Off. You should now be looking at the Turn Windows Features On or Off window. This is the window where you can install, uninstall, turn on, and turn off many of Windows 7’s applications and features. Locate a folder in the window labeled Media Features and click the Plus symbol next to it. Listed here are the media features installed on your PC. Now you can also get rid off all the other junk like Internet Explorer, games, etc. Google for ideas and clear up clutter from your PC. If you decide you want to use Windows Media Player again, log in to Windows 7 using an account with administrative privileges. Go to the Turn Windows Features On or Off window and recheck the box next to Windows Media Player under the Media Features folder. Follow the onscreen instructions and you will be able to use the application again. Which means taking care to either not download them, or take even more care after installing. I tended to use players other than WMP. But I never got rid of it since it does have support for some things missing in others. One example is PGS subtitles. Doing video conversions and whatnot, once you have to start messing with PGS subs it really reduces the software options. I forget what the particular setting in WMP was. I just remember it could play PGS subs out of the box in some videos where other players couldn't.